Increasingly, ethical concerns are being raised regarding bioenergy production. However, the ethical issues often do not stand out very clearly. The aim of the present paper is to improve on this situation by analyzing the bioenergy discussion from the perspective of land use. From this perspective, bioenergy production may give rise to ethical problems because it competes with other forms of land use. This may generate ethical problems mainly for two reasons. First, bioenergy production may compete, directly or indirectly, with food production; and as consequence the food security of poor people may be adversely affected (social aspects arguments). Secondly, the production of bioenergy may directly or indirectly lead to deforestation and other changes of land use that have a negative effect on greenhouse gas emissions (environmental arguments). So from this perspective the main challenge raised by bioenergy production is to secure responsible land use. The purpose of the paper is not to advocate, or promote, a specific ethical position on bioenergy, but to structure the main arguments found. The paper falls in two parts. One part addresses social aspects arguments for using agricultural land for bioenergy—where food insecurity, malnourishment, and significant food poverty are the main concerns. The second part scopes environmental implications—notably greenhouse gas emissions impact, as affected by deforestation and other (indirect) land-use changes. Alongside showing some of the current dilemmas presented by wider land-use changes, arguments are analyzed from two ethical angels: a consequentialist and a deontological. We would like to thank two anonymous referees for helpful comments. Special thanks are also due to Paul Robinson. Financial support through the Subproject “International and national governance of bioenergy: trade, environment and integration of energy systems” under the Research Alliance “Enabling and Governing Transitions to a Low Carbon Society” funded by the Danish Council for Strategic Research (Grant no. 09-067275/DSF) and the UK project LACE and the BBSRC Sustainable BioEnergy Centre (BSBEC) is gratefully acknowledged. Bach, F. B. (2009). Biofuels: Hunger, subsidies and lack of effect on CO2 emission. In M. Gjerris C. Gamborg J. E. Olesen & J. Wolf (Eds. ), Earth on fire (pp. 169–174) Copenhagen: The Institute of Food and Resource Economics, The Faculty of Life Sciences, University of Copenhagen. Available at: <http://curis.ku.dk/portal-life/files/14971824/Earth_on_Fire_forbedret.pdf http://curis.ku.dk/portal-life/files/14971824/Earth_on_Fire_forbedret.pdf. Accessed 2 March 2011. Bouët, A., Dimaranan, B. V., & Valin, H. (2010). Modeling the global trade and environmental impacts of biofuel policies. IFPRI discussion paper 01018. The International Food Policy Research Institute (IFPRI). Available at http://www.ifpri.org/publication/modeling-global-trade-and-environmental-impacts-biofuel-policies. Accessed 7 August 2011. Connor, D. J., & Hernandez, C. G. (2009). Crops for biofuels: Current status and prospects for the future. In R.W. Howarth & S. Bringezu (Eds. ), Biofuels: Environmental consequences and interactions with changing land use (pp. 65–80). Available at http://cip.cornell.edu/biofuels/. Accessed 2 March 2011. Cushion, E., Whiteman, A., & Dieterle, G. (2010). Bioenergy development: Issues and impacts for poverty and natural resource management. Washington, DC: The International Bank for Reconstruction and Development/The World Bank. Available at http://www-wds.worldbank.org/. Accessed 7 August 2011. Doornsbosch, R., & Steenblik, R. (2007). Biofuels: Is the cure worse than the disease? OECD Roundtable on Sustainable Development. Available at http://media.ft.com/cms/fb8b5078-5fdb-11dc-b0fe-0000779fd2ac.pdf. Accessed 2 March 2011. European Commission. (2010). Report from the commission on indirect land-use change related to biofuels and bioliquids. Available at: http://ec.europa/energy/renewables/biofuels/doc/land-use-change/com_2010_811_report.en.pdfhhtp:. FAO. (2008b). Bioenergy, food security and sustainability—towards an international framework. FAO. Available at: http://www.fao.org/fileadmin/user_upload/foodclimate/HLCdocs/HLC08-inf-3-E.pdf. Accessed 2 March 2011. German, L., Schoneveld, G., Skutch, M., Andriani, R., Obidzinski, K., Pacheco, P., Komarudin, H., Andrianto, A., Lima, M., & Dayang Norwana, A. A. B. (2011). The local social and environmental impacts of biofuel feedstock expansion: A synthesis of case studies from Asia, Africa and Latin America. [online] available at: http://www.cifor.cgiar.org/publications/pdf_files/infobrief/3295-infobrief.pdf. Accessed June 2011. Gomiero, T., Paoletti, M. G., & Pimentel, D. (2009). Biofuels: Efficiency, ethics, and limits to human appropriation of ecosystem services. 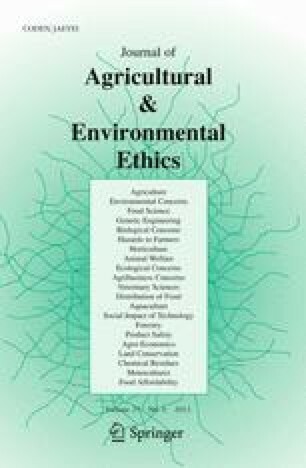 Journal of Agricultural and Environmental Ethics. doi: 10.1007/s10806-009-9218-x. Howarth, R. W., & Bringezu, S. (2008). Biofuels: Environmental consequences and interactions with changing land use. Available at http://cip.cornell.edu/biofuels/. Accessed 2 March 2011. IEA. (2008). From 1st to 2nd-generation biofuels technologies. http://www.iea.org/papers/2008/2nd_Biofuel_Gen.pdf Accessed 20 March 2011. Rice, T. (2010). Meals per gallon. The impact of industrial biofuels on people and global hunger. London: ActionAid UK. Available at http://www.europolitics.info/pdf/gratuit_en/266253-en.pdf. Accessed 19 March 2011. Steinfeld, H., Gerber, P., Wassenaar, T., Castel, V., Rosales, M., & de Haan, C. (2006). Livestock’s long shadow—environmental issues and options. FAO report. http://www.fao.org/docrep/010/a0701e/a0701e00.HTM. Accessed 7 June 2011. UNEP. (2009). Towards sustainable production and use and of resources: Assessing biofuels. [online] available at: http://www.biomassenergycentre.org.uk/pls/portal/docs/PAGE/RESOURCES/REF_LIB_RES/PUBLICATIONS/UKBIOMASSSTRATEGY.PDF. Accessed February 2011. UNICEF, WHO, UNESCO, UNFPA, UNDP, UNAIDS, WFP, The World Bank. (2010). Facts for life. (4th ed.). New York: United Nations Children’s Fund. Availble at http://www.factsforlifeglobal.org/resources/factsforlife-en-full.pdf. Accessed 8 August 2011.